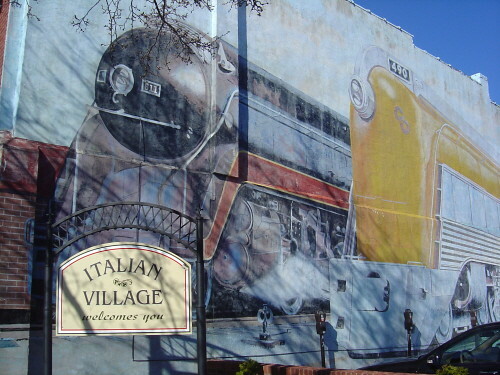 When my Dad grew up in Columbus, OH in the neighborhood around High and Goodale Streets, they didn’t call it Italian Village. Back then, when this neighborhood was an ethnically-mixed, working-class ghetto you wanted to get out of, the poor folks who lived there called it Flytown. 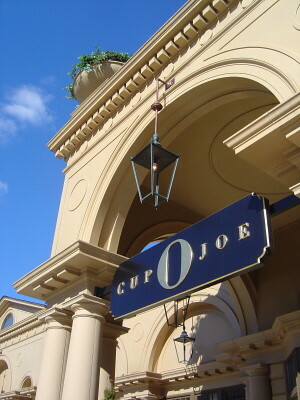 My Dad’s name is Joe…but this posh Short North coffee-shop isn’t named for him. 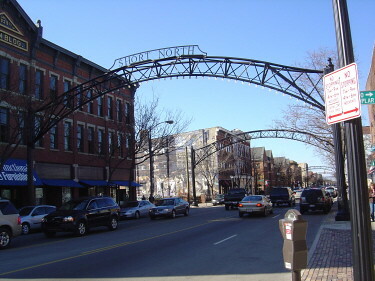 When I last lived in Columbus in 1980s, the Short North was not a neighborhood where you wanted to stop for coffee…unless, of course, you were a cop stopping for caffeine after another night of busting teenage prostitutes and the shady businessmen who patronized or pimped them. 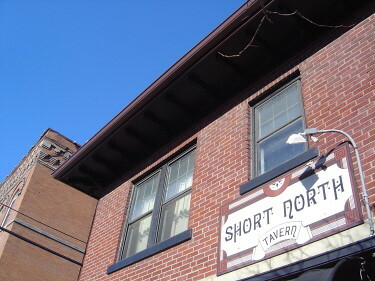 In the ’80s, “Short North” was the Columbus police department’s shorthand term for an urban strip of High Street where not much good was going on. Still, when developers came in and began gentrifying the working class neighborhoods along High Street, a lot of average working folks found themselves priced out of their homes. Although my Dad’s mother, sister, and brothers had long since left Flytown for nicer neighborhoods, when gentrification in the area soon-to-be-renamed the Italian Village began, my Dad astutely noted that had they kept the old house they’d been so quick to move out of, they would have ultimately been sitting on a goldmine: prime real estate in a neighborhood destined to be Yuppified. Whether or not living in the Short North is worth its fashionable price-tag, the fact remains that this once-shady district is now a premier place to hang out. As Gary and I window-shopped High Street’s various upscale boutiques, I kept marvelling that this was Columbus we were browsing; when I was a teenager in Columbus, there was virtually nothing to do downtown other than maybe roll tumbleweeds down the all-but-abandoned streets. These days, you can go Gallery Hopping the first Saturday of every month, or simply sightsee (and be seen) every other fabulously fashionable day. In case you can’t read that condo-banner, here’s an enlargement. 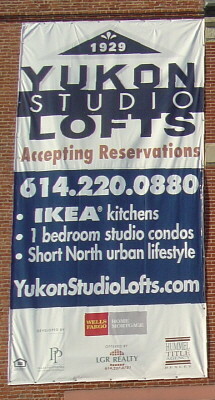 As if having a Short North address isn’t fashionable enough, the Yukon Studio Loft condos boast Ikea kitchens, something my Dad definitely never had in the Flytown home of his childhood. If it seems odd to sell real estate on the basis of its kitchen appliances and furniture, keep in mind that there are no Ikea stores in Ohio, but there are Ikea fanatics there. Apparently the best way to furnish a tony Short North condo is with funkily fashionable Swedish furniture…and I’d be willing to bet that Swedish-made lamps work better than the Short North’s stylish but non-functional street arches. 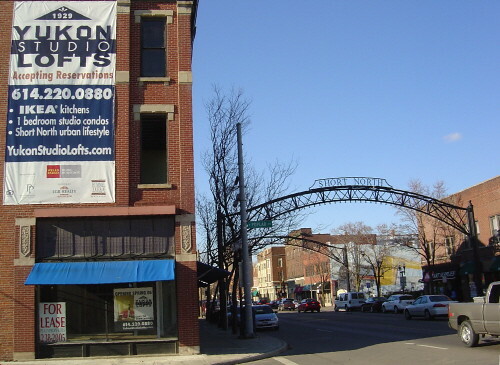 So if you’re looking for the “urban lifestyle” of one-bedroom lofts, non-functional street lamps, and arty murals, the Short North district of downtown Columbus, OH might be just what you’re looking for. 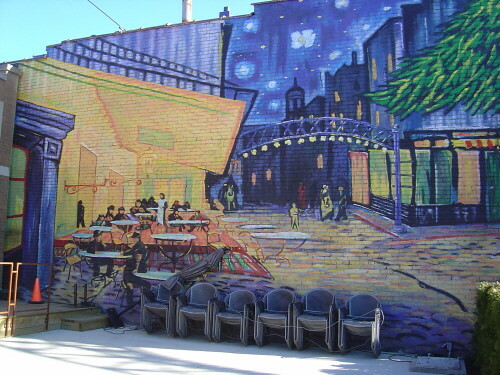 The art scene is hot and the hangouts are cool…just don’t offer an over-priced cup o’ Joe to an old Italian Daddy named Joe, or he might regale you with stories of the old days when this was a ghetto called Flytown. 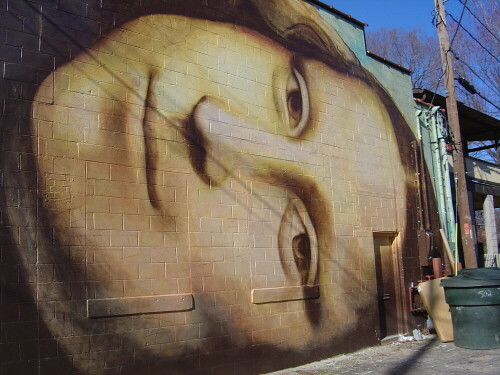 Great murals! New Hampshire needs more of them. 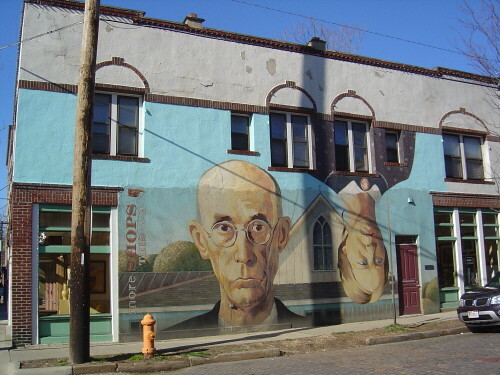 I have never been in Columbus, but if I ever go, I’ll be sure to find those great murals. columbus sure isn’t short on talent. 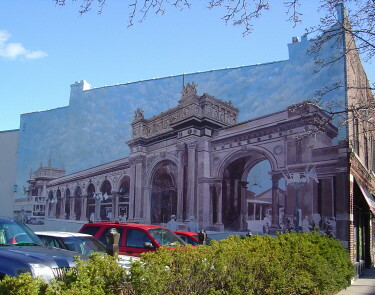 i would love to see those murals in person one day. Yes, the murals were the highlight of our visit. We had an area Chamber of Commerce brochure that listed the various shops & had a map with all the murals, so we made sure to see & photograph them all. The neighborhood is rightfully proud of their “curb appeal”! Love that some artists are getting work. But the Ikea thing just proves that you can’t buy good taste. Columbus has every other Big Box/chain store, so I’m surprised they don’t (yet) have Ikea. Ohioans are so typical of “middle America,” corporations often use cities like Columbus to test-market their wares: if folks in Columbus will buy it, other Americans will, too. So the fact that Ikea has sidestepped Ohio is a bit curious.